BENJAMIN, Judah Philip (1811-1884) was a lawyer and politician who was a United States Senator from Louisiana, a Cabinet officer of the Confederate States and, after his escape to the United Kingdom at the end of the American Civil War, an English barrister. Benjamin was the first Jew to be elected to the United States Senate who had not renounced that faith, and was the first Jew to hold a Cabinet position in North America. Autograph Document Signed “J.P. Benjamin” 1pp. 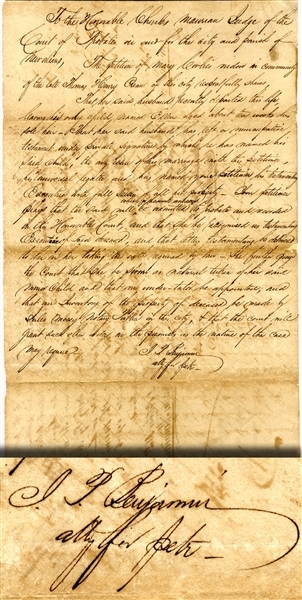 folio, 1833, being a probate court document from New Orleans, pertaining to the death of Thomas Henry Crean and his only child. Fine condition.